The LuxR M2 Large Recessed Square Louvre is a small low-voltage dimmable outdoor washer with a distance across the flats of 61mm, larger than the 53mm regular luminaire and useful when the mounting hole is generous or hole coverage is a priority. 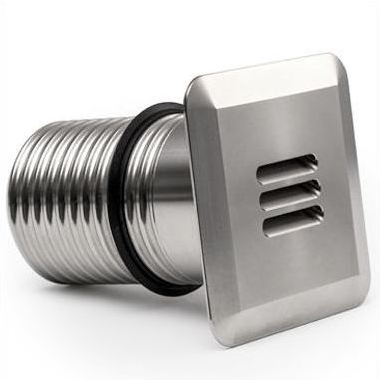 Precision machined in marine grade 316 stainless steel, copper or powdercoated aluminium, the luminaire achieves IP68 water ingress rating for peace of mind. The Cree 2 watt max LED can be easily replaced if required or substituted for a colour LED. The optic is also simple to change if you wish to alter the beam width.